Algeria drew with Russia 1-1, and will progress to the round of 16. With the draw, Algeria have made history by being the first North African team in the knock-out round of the World Cup. Aleksandr Kokorin’s 6th minute header puts Russia in the lead. Dmitriy Kombaro provided the assist with a cross. 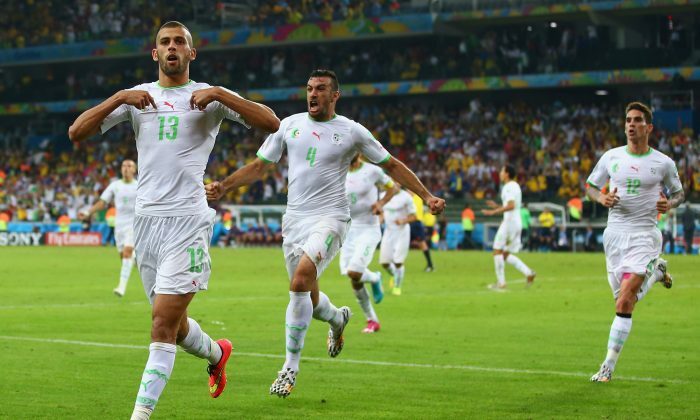 Islam Slimani equalized for Algeria in the 60th minute with a header. Yacine Brahimi provided the assist via a corner kick. CURITIBA, Brazil (AP) — Algeria has qualified for the World Cup knockout stages for the first time, with Islam Slimani’s headed equalizer giving his team a 1-1 draw against Russia on Thursday and enough competition points to reach the second round. Slimani’s 60th-minute equalizer came after Russia goalkeeper Igor Akinfeev failed to catch a swinging left-foot free kick from Yacine Brahimi. That was the second costly error that Akinfeev has made in the tournament for Russia. Brahimi had troubled the Russia defense consistently until his substitution late in the game. Along with midfielder Sofiane Feghouli, he helped neutralize much of Russia’s attacking intent through the second half. Before Algeria’s equalizer, Russia had chances to double its lead, notably in the 26th minute when Oleg Shatov weaved through the Algeria midfield but his right-foot shot drifted wide of the Algeria post. Russia hasn’t qualified for the second round of the World Cup since 1986 when it played under the umbrella of the Soviet Union. Algeria came closest to qualifying for the second stage at the World Cup in 1982, but West Germany and Austria played out a result that suited both of those teams. The European teams, meeting a day after Algeria had won its last group game, knew that a 1-0 win for West Germany would put both through to the second round at Algeria’s expense. It remains one of the most contentious group games in the tournament’s history.